Review: St. Mary's College of Maryland, established in 1840, is a public, secular liberal arts college located in St. Mary's City, Maryland. It is a member of the Council of Public Liberal Arts Colleges and designated as a Public Honors College (the only one in the state of Maryland and one of few around the U.S.). St. Mary's College is a small college, with about 2,000 enrolled students. The institution offers baccalaureate degrees in 22 disciplines, of which psychology, biology, and economics are among the most popular. The institution also offers one postgraduate degree, a Masters of Arts in Teaching. The college shares much of its campus with Historic St. Mary's City, the fourth site of colonization in British North America and one of the premier archaeological sites on the East Coast. 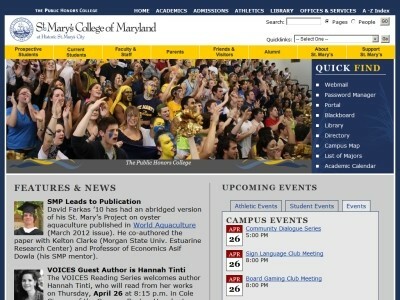 Location & access map for "St. Mary's College of Maryland"